Taffy has an Atlantic City-based origin story and a history that spans well over a century. 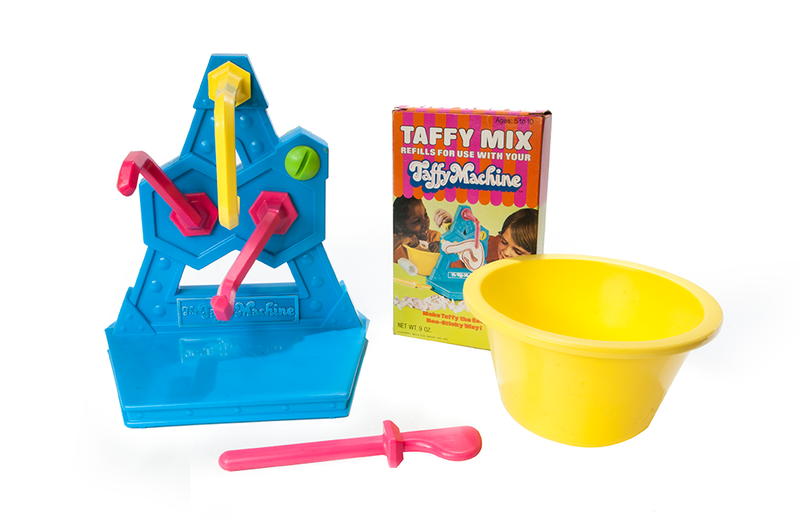 In 1975, Kenner brought taffy making to children, with the release of one of their more peculiar food-centric toys, The Taffy Machine. The multi-colored Taffy Machine was designed to mimic the operation of the traditional taffy pulling machines that were typically seen working away at candy shops or boardwalk concession stands. Kenner’s offering was entirely kid-powered, opting for a manual crank handle instead of batteries. Similar to the Easy-Bake Oven, The Taffy Machine came with three “just add water” mixes and an appropriately sized mixing bowl. The process of creating taffy was a simple matter of adding water to the mix, placing the mixture on the machine, and turning the crank. Food coloring and a dropper were also provided to allow kids to flavor their culinary concoctions in chocolate, cherry, or grape. Rounding out the package was a spatula, mixing cup, and some obligatory candy wrappers. To promote continued use, Kenner also sold a variety of refill kits for the toy. The Taffy Machine disappeared from store shelves in 1979. It’s international espionage on the high seas with the Electronic Radar Search Game from Ideal! The Caravelle is an easy-to-assemble transistorized AM radio receiver and transmitter from Remco that allows you to dazzle anyone within a 500-foot radius with your DJ skills and gift for the gab.